Blurb: I've never read anything so poetic. Condie truly is a master of words. Review: Oh my word. From the second I opened this book I was hooked. I'm averaging about one book every two weeks this semester, and I read this one in less than TWO DAYS. The first thing that struck me was how poetic this book is. Matched has a lot of poetry, and it's a big theme in the book. Crossed IS poetry. Some of the chapters are actually written in stanzas! The story flows together beautifully, and I was on the edge of my seat the entire time. Which is why I was surprised when I went to my mother's book club and people said they had heard Crossed was bad. Apparently, the main criticism it is receiving is that it's too slow, and doesn't go anywhere. I disagree. It definitely goes somewhere. There are very few moments where the characters are just doing nothing. And even if they aren't actively running for their lives, there's always intrigue, betrayal, mystery, etc. Speaking of betrayal: THERE IS NO SEQUEL PHASE IN THIS BOOK! That made me so happy I almost cried. Yay for love interests staying loyal! But, I will nod my head to the critics and say that if you didn't like Matched, you won't like Crossed. If you loved Matched, you'll probably like Crossed. The only problem I had (and it's a small one) is that the book is written in first person, but the chapters alternate between Ky's perspective and Cassia's. I got so swept up in the story that I often forgot who was narrating and found myself flipping back to the chapter heading a lot. I wish their names had been at the top of each page. But it wasn't a big deal. In conclusion, Crossed was amazing. It didn't quite give us as much information as Matched but it is even more beautifully written. I LOVED it. I felt nearly exactly the same way you did. So happy to see someone else adore the poetic writing and love the book in spite of others' reactions to it. Yep, we have not seen too many good reviews of Crossed, but like you, we really enjoyed the poetry of Matched, so hopefully we'll feel the same way you do! Thanks for writing such a great review. Thank you! Someone else that appreciates this book for what it is. It is not an action-packed, fast-paced dystopian. 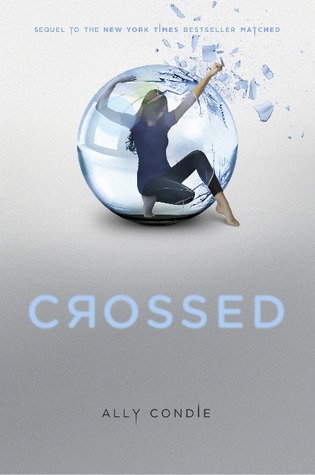 I didn't love Matched, but I have to say that I really loved Crossed. I'm glad to see that you liked it. I've read some of the bad reviews and been worried. My copy is still in the stinkin' mail somewhere! :( Maybe I'm going to have to upgrade to an Amazon Prime account. haha, awesome review! Sad to say, I haven't read either book in this series, but I've definitely been meaning to. I keep hearing such good things about the characters, and I love hearing that the language is just as carefully crafted as the plot and character.